Pegasus, the beautiful winged horse of Greek mythology, comes from a tradition littered with hybrid creatures - centaurs that are half man and half horse, fauns - half man and half goat, furies and harpies - half women and half flesh tearing birds, serpents that speak through the mouths of half-drugged oracles like the snake and the Oracle of Delphi. But in the Greek menagerie of mythical creatures, Pegasus is unique. He doesn't speak. He isn't a trickster setting traps, riddles or challenges for the heroes of his stories or god in disguise trying to seduce young maidens. Quite simply, Pegasus is a beautiful and brave white stallion who performs dutifully and without question for the riders who tame him. He is a horse who has the characteristics people associate with horses - strength, loyalty, speed. Of course, there is a difference between Pegasus and your average garden variety horse; Pegasus has beautiful feathered wings and he can fly. Pegasus is woven into many mythological stories but the main one is about his capture by and adventures with Bellerophon. Bellerophon was, by all accounts, a bit of a bad boy who got himself into a spot of bother by messing around with a lady he should not have been messing around with - the wife of a king. She kissed and told. What with one thing and another, Bellerophon was set some impossible tasks by which he would either redeem himself or die trying (those stories are part of Bellerophon's myth - for another time). Bellerophon was sent to slay the Chimera, a ferocious fire-breathing monster with the body of a goat, the head of a lion and the tail of serpent (one of those hybrids we mentioned earlier). Along the way on his hero quest, he met a seer from Corinth who told him he had to catch and tame the winged horse to accomplish his task. The winged horse hung out near the Peirene Fountain, fed by a spring Pegasus had released himself, by striking the ground with his hooves. The hero would require the help of Athena, the seer said. Bellerophon slept in Athena's temple and dreamed of a golden bridle that would tame Pegasus. When he woke, the golden bridle was beside him. As predicted, he found Pegasus near his fountain, bridled and mounted him and set out to kill the Chimera. To kill the fire-breathing Chimera, Bellerophon created a large, red hot cube of lead and mounted it on the end of his spear. On Pegasus, he raced straight at the monster - the loyal horse not wavering as it approached the mouth of flame - and shoved his hot melted lead tipped spear into the Chimera's mouth, The Chimera suffocated, its flames quenched by hot metal. After this triumph, Pegasus and Bellerophon went on through several more adventures (as we said, another story, another time), but like a lot of mythological heroes, Bellerophon's ego, fed by all his triumphs, began to swell. He decided he must be a god and deserved a place on Mount Olympus, so headed up on his trusty steed, Pegasus, to sit among the other gods. Zeus, the head honcho on Olympus, was offended by Bellerophon's hubris. He sent a stinging insect to bite Pegasus who reared up and threw Bellerophon so that the hero fell to earth. Pegasus became a servant of Zeus, king of all the gods. In that role, he brought thunder and lightning from the heavens at Zeus's command. He was also a companion to the Muses and at the behest of Poseidon, his father, struck Mount Helicon, the Muses' mountain, with his hooves to bring forth the Hippocrene Spring. The mountain, it seems, was swelling to bursting point at the songs of the Muses. There is, in fact, another tradition that suggests that wherever Pegasus struck the ground, pure water would spring up. In the end, Zeus rewarded Pegasus for his years of loyal service by turning him into the constellation in the Northern sky that bears his name. There are a few different origin stories for the winged horse, perhaps because he has precursors in cultures that are parallel to or earlier than the ancient Greeks. Stories of winged horses exist in Assyrian imagery, in Persian stories - where he is called - Pegaz - and in the culture of the Luwians, a Bronze and Iron Age language group that populated parts of Eastern Europe and Asia Minor. In the Greek story, Pegasus was fathered by Poseidon, the Greek god of the sea, and was born of Medusa, the gorgon with a head writhing in snakes. According to the most popular legends, when Perseus - another Greek hero - slew Medusa by chopping off her head, Pegasus and his brother Chrysaor sprung, full-grown from her spilled blood. Nothing much is heard of Chrysaor in the stories thereafter. There are not temples devoted to Pegasus as the winged horse was not a god. But he is associated with Mount Helicon, the Muses' mountain, near Kyriaki, a large village, about six miles inland from the north coast of the Gulf of Corinth. It was here that legend says he created the Hippocrene Spring. 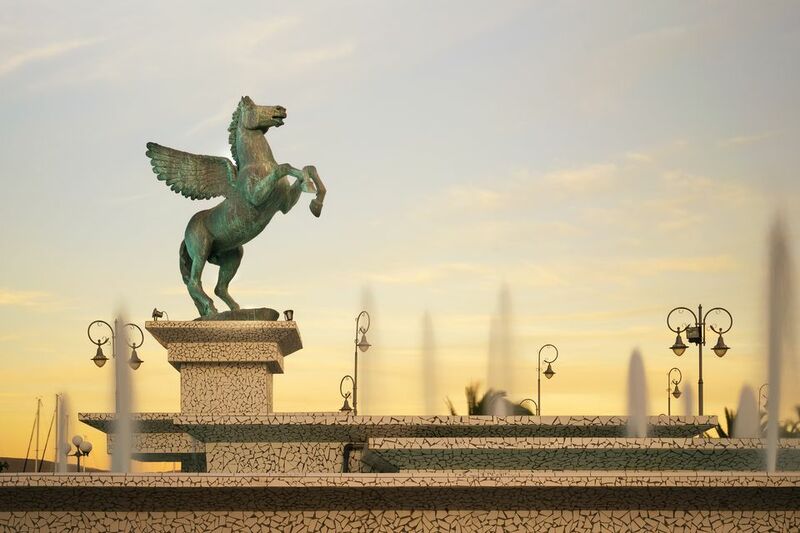 The winged horse is also associated with the city of Corinth, where Bellerophon captured and tamed him beside the Peirene Fountain. The fountain actually existed and, if you visit Corinth, you can look for it in Acrocorinthe, the ancient fortress above the city. Several arches and the remains of the reservoirs of the fountain are on the northeast side of the ancient site.